Good financial planning in simple terms is a professional assessment of where you are now, compared to where you wish to be in the future, with recommendations to help you to move forward, followed by regular reviews to monitor progress and provide further advice. Most people have financial goals they wish to achieve to help make their dreams become reality. However, without a plan to follow, a goal is just a wish. Planning with the help of a qualified and experienced Financial Adviser can make your financial future more secure, helping you achieve your financial goals. Our holistic approach encompasses all aspects of a client's financial affairs, providing a complete and genuinely impartial financial planning service. Step 1 – Discovery: Discuss & understand your needs and financial goals. Step 2 – Definition: Identify & agree order of priorities. Step 3 – Analysis: Research & analyse data to develop your financial plan. Step 4 – Recommendation: Meet to present & discuss your financial plan. 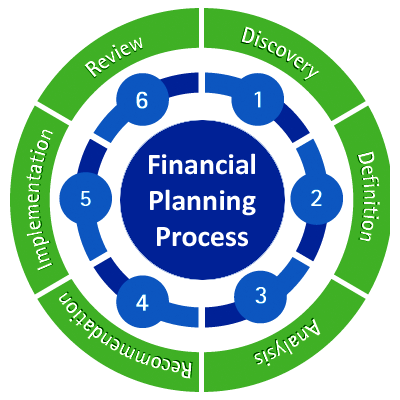 Step 5 – Implementation: Apply & execute your agreed financial plan. Step 6 – Review: Monitor & revise your financial plan at regular intervals. All new clients receive an initial consultation without charge or obligation. In the meeting we determine your current financial situation, and you have an opportunity to find out about us, the services we offer, and an idea of any costs which may be involved. We provide you with our Client Agreement and a About Our Services charges documents to ensure you are fully informed. During our discussion we will help identify your financial goals and objectives, and look at what provisions you have made already. As part of this we will complete a financial questionnaire and risk profile with you which we use as the basis of our analysis and any recommendations. We will consider the suitability of your existing plans, identify any alternative courses of action, consider your priorities, and review any budget you wish to work within. Having identified the areas requiring advice we will prepare a financial action plan to address the issues concerned, researching the whole market for suitable solutions for your consideration. At the next meeting we will present and explain our recommendations, provide clear information on any products and their fees or charges, the time-scales involved, and of course answer any questions you may have. If you agree with our recommendations we will help implement the plan with you, providing and submitting the relevant paperwork, and ensuring all aspects are dealt with, keeping you informed as your financial action plan is implemented. Once in place, we will recommend that you continue with ongoing reviews of your financial plan, we will agree a suitable Ongoing Service Level* with you, then monitor and review your financial situation, updating policies or advising you on investments as required. Contact us today & arrange a free initial consultation with a Financial Adviser. Please Note: The value of investments can go down in value as well as up, and you may not get back all of your original investment. Nexus gave us excellent and professional advice... in an efficient and friendly way. Always found us the most suitable products at the best prices. Service has always been polite, friendly and incredibly efficient.